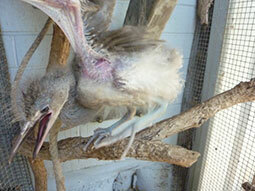 When asked what is my favourite bird to care for, I am divided between the tawny frogmouths and the herons. 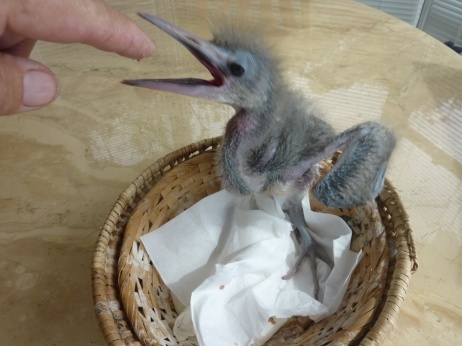 I had been away for four months so I was really happy that the first bird I was asked to care for was a heron chick. Little did I know what I was in for. This baby has a real attitude, swallowing my fingers as well as the food offered. This is a really difficult exercise and when I fail to get the food down his throat in the accepted way he gets really aggro and puts his head onto the floor and arches his wings above his body and screeches and screams. When he is in one of these tantrums there is nothing I can do but leave him alone to cool off. I have never cared for a bird with such attitude. What a character. He put on weight in proportion to the huge quantity of fish and associated food he consumed and after 30 days he fledged and was put outside in an aviary. He really needed special facilities and so I took him to prison. 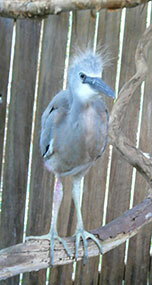 The John Morony correction centre has a wildlife rehabilitation facility and their waterbird area is second to none. He therefore had the use of wonderful landscaped pools that he shared with a variety of water birds including two black swan cygnets. Eventually he was set free to explore the “protected” area and find his wings and flee, unlike the less fortunate human residents there.